Over 90 minutes the film tracks a debate series between the conservative Buckley, editor of National Review, and the liberal Vidal, author of Myra Breckinridge, a satire on the American film industry. The backdrop to this is ostensibly the 1968 Republic convention in Miami and its Democratic counterpart in Chicago, though far more germane are the faltering fortunes of the ABC News network, whose set literally collapses at one point. Political tension outside the convention halls is rife, the presidential hopeful Bobby Kennedy and black rights activist Martin Luther King having both been shot dead earlier in the year, and protests keenly flaring up against the Vietnam War. Though some play is made of the the precariousness of 1968 in American politics (the date also having salience in France), the main subject of the film is the antagonism between the two contestants. As the late Christopher Hitchens, a man no stranger to a good feud, puts it, the hatred between the two was not confected. Buckley viewed the progressive, sexually subversive politics of Vidal as undermining the stability of American society, a point made explicit in some of their exchanges regarding Myra Breckinridge, whose main character is a transexual woman. Gore, by turn, saw his opponent as a politically bad man, and openly relished the notion that Buckley had gone to hell after his death. The film’s most explosive exchange occurs during a discussion on police violence that occurred around the Democratic convention, with Vidal criticising the excess of the police and Buckley commending their restraint, given the protestors were flying a Vietcong flag. At this point the moderator puts it to Gore that if the protestors had flown a Nazi flag during World War Two the reaction might have been expected, to which the author replies that in the States people should be able to state their views openly. This sounds both milder and yet more shocking today than it would have done at the time, though Buckley did apologise for it and by all accounts seemed to rub along fine with his wife’s gay friends, even if his printed views towards homosexuality cannot be described as warm. That this should serve as the climax of the film – pre-empting the closing credit montage of the modern bickering punderati – is perhaps more telling than any of the commentators’ musings on the subject matter. One can finish the film with no understanding of what grounded Gore and Buckley’s conflicting visions for America and the wider world, in much the same way today’s pundits mostly showcase their views rather than their reasons. Buckley’s role in fathering the brand of economic liberalism and social conservatism that led to Ronald Reagan’s rise stateside and Margaret Thatcher’s ascent in Britain is touched upon, but only so as to suggest politics is subservient to the media. This is ironic for the more bohemian Vidal, whose eloquence never translated into political effectiveness, despite his later attempt to rebrand himself as America’s biographer. 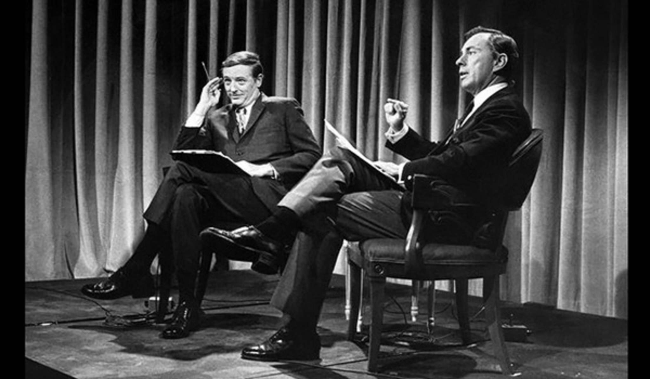 In the end though, those wishing to use this as a way of bashing the way the media for stoking disunity should note it was the excellent ratings for Buckley versus Vidal that led to ABC’s rivals aping the format. Scepticism about just how intellectual public life was in the States in that era is also justified, bearing in mind how many people could commit brazen offences against reason in their attacks on sexual and racial minorities, and the rights of women. Whether American politics is more partisan in 1968 is something else worth questioning: Just how would one measure such a thing in national terms, the stalemate between Congress and the president notwithstanding? Still, in the age of the Trumpster the role the media has to play in public life is clearly in need of more scrutiny, irrespective of how one voted on Super Tuesday. And for anyone interested in the subject, this is a fine place to begin. Previous Article← A New Day on Fleet Street?